There's never a time I go fishing without a few jigs rigged and ready. I've had a lot of success with 'em over the years and they have become a major player for me, whether I'm fishing tournaments, guiding or just goofing off. 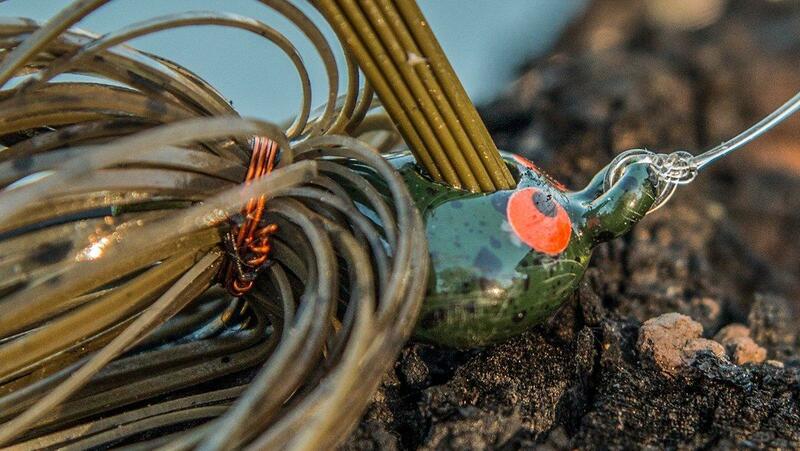 I think they're one of the best big-bass baits that have ever been invented. With all of that being said, however, I've been a little disappointed in some of the mass-produced jigs I've seen in recent years. Many of them are poorly constructed and seem to be thrown together. They'll catch some fish, but it's not long until they're falling apart and sending you back to the tackle shop to buy more. I've been testing the Z-Man CrossEyeZ Flipping Jig for a few months and even though I try to avoid using the dreaded "b-word" in my reviews, it's legitimately one of the best flipping jigs I have used. I'll take you through the design features and give the reasoning behind my bold statement. 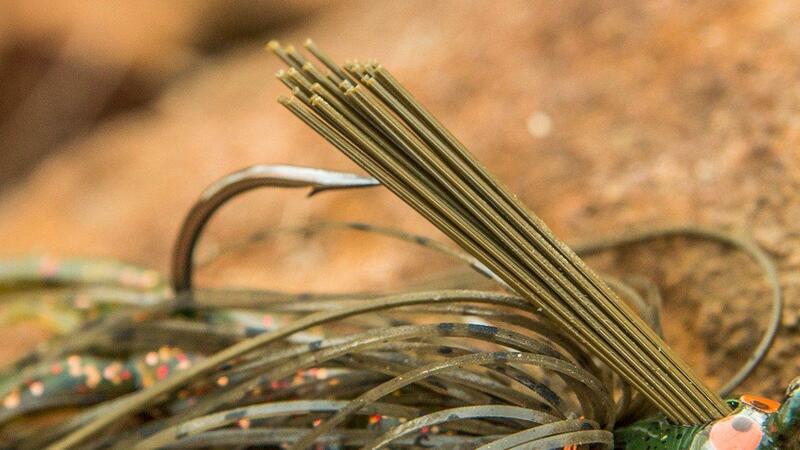 Hand-tied jig skirts are becoming really tough to find unless you track them down through a custom jig builder. 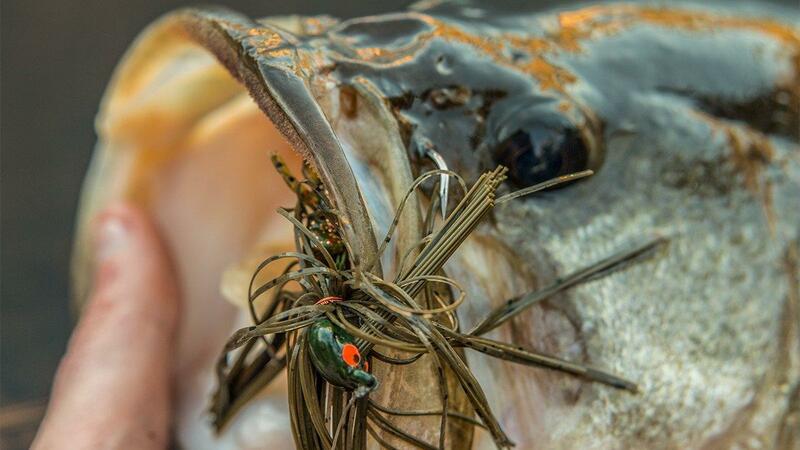 You'll run across a lot of skirts that are held on by a single rubber band that either dry rots after a month or gets completely jacked up after catching a nice bass. I've tested many of these jigs and some of them leave more skirt material on my boat carpet than the actual jig. 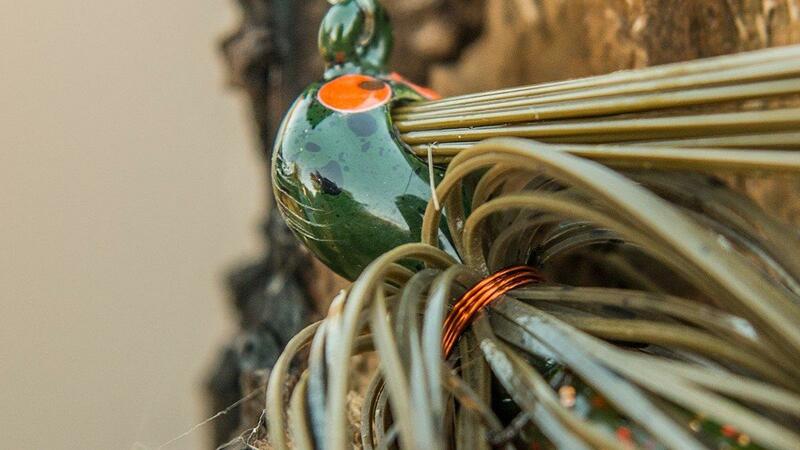 The Z-Man CrossEyeZ Flipping Jig skirt is 100 percent silicone and hand-tied with copper wire. You can slap it on the water, knock it against docks and catch a pile of bass without a single strand coming out of place. You can even tug on the skirt to purposely mess it up and it won't budge. This is a huge selling point for me. I expected the price point to be higher because of this welcomed addition, but it's still holding firm at $4.99. I really like the Z-Man CrossEyeZ Flipping Jig's head shape. I was a little worried at first because it's a bit wider than others I've used, but after fishing with it for a while I've turned into a big fan. 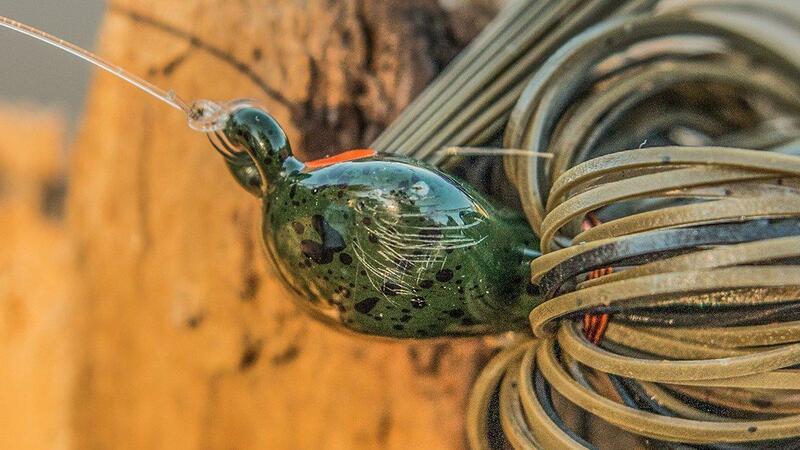 You honestly have to try to get this jig snagged in wood. It comes in and out of wood cover better than most jigs I've used. The wide head profile actually helps a lot with skipping underneath cover. I've been able to make some very complex casts without even thinking twice because it has the surface area needed to skip across the water with ease. This jig is built around a 4/0 VMC Flipping Hook, which is one of my favorites. It will not bend or flex with heavy line or hard hooksets and it pins bass in the roof of the mouth nearly every time. I've tried both slack-line and tight-line hooksets and haven't noticed a difference in hookup ratio. I've even felt a small "pop" when setting the hook as the hook drives through the hard part of their mouth. Thankfully, the weed guard wasn't an afterthought with this jig; it's pre-trimmed straight from the package and it really helps protect the hook point as you're dragging that jig towards the boat. It's actually quite collapsible as well, which helps that weed guard get out of the way when it's time to set the hook. I'm not much of a tackle tinkerer, so I'm really happy that this jig is ready to use straight from the package. I honestly wouldn't add a thing to it. I think a lot of anglers get their feelings hurt when fishing a jig because their number of bites goes way down. I can see why, though, because a lot of 'em are just too bulky for those 2-pound bass that live throughout the country. I've been really happy with the size and profile of this jig, though. It's bulky, but also small enough that it doesn't discriminate against smaller keepers which can make a huge difference in tournament fishing. 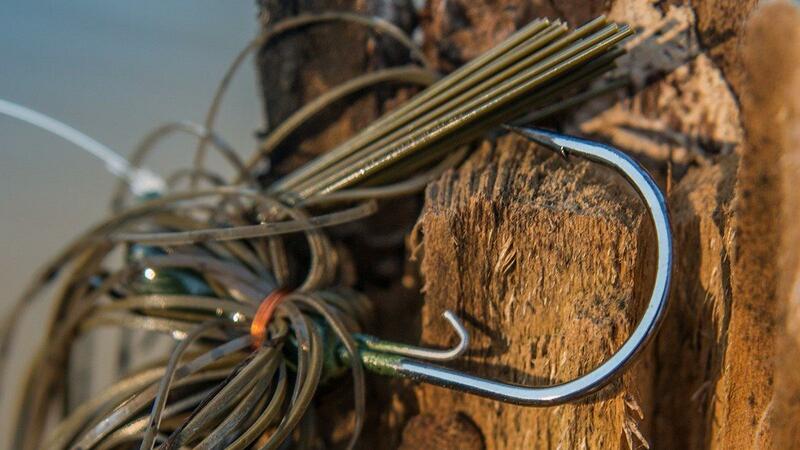 You can go down a long row of docks with this jig and expect to catch both quality and quantity, which will add an addictive element when anglers start using it. 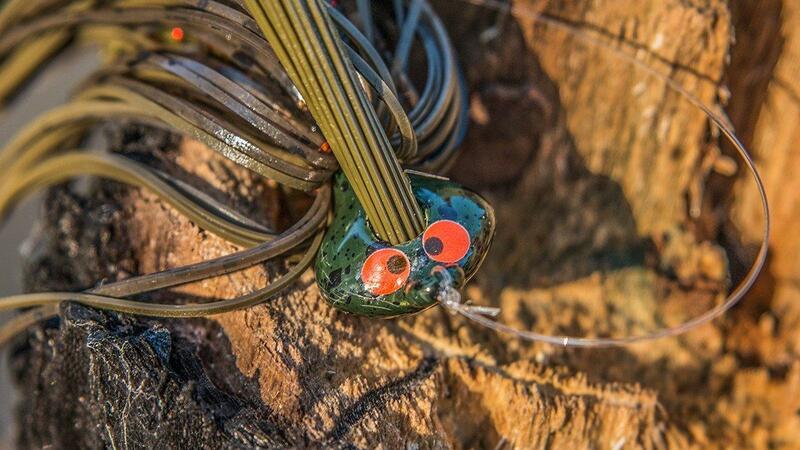 The Z-Man CrossEyeZ Flipping Jig's wire keeper does exactly what all keepers should do; it keeps your trailers pinned after lots of skip casts and fish catches. I've been using a Turbo CrawZ as a trailer and the keeper design keeps the stretchy ElaZtech plastic in place without a hitch. I've also made sure to test this jig with traditional soft-plastic trailers and have been equally impressed. I rarely say this, but I don't think I'd change a single thing about this jig. I'm going to be using it all year and I'm sure it's going to account for some really nice fish catches. If you're a jig fisherman, I'd strongly suggest trying one of these jigs. Just try one, test it out and I bet you'll be back for more. The Z-Man CrossEyeZ Flipping Jig is available in 3/8, 1/2 and 5/8-ounce sizes and can be found at TackleWarehouse.com.